Each one of us wishes to look our best as the face is the mirror to our soul. 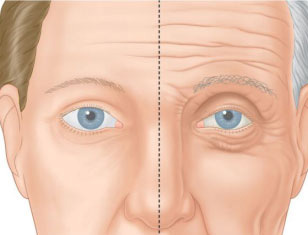 Often with eyelid bags one appears chronically tired or older and faces innumerable questions from those they interact with. An Ocular Aesthetic Consultant can assess your face and your lifestyle in detail and discuss various suitable options for your individual needs. The Ocular Aesthetic Services covers a wide spectrum of cosmetic procedures and surgeries that help to enhance your facial appearance. We have the availability of Radiofrequency unit for enabling near bloodless and fine surgery. Cosmetic procedures like Blepharoplasty are customized as per individual patient needs and can be performed in patients with unsightly lower eyelid fat bags or with excess skin fold/fat in the upper eyelid. The lower eyelid can be operated through an internal approach leaving absolutely no skin scar while the upper eyelid scar is hidden in the eyelid fold. Aging is something none of us can escape from but we do have the option of aging gracefully. Genetics and life style play a great role in how we age. Consultation with an Ocular Aesthetic Surgeon can help you know available options for your concern, the need for Botulinum toxin injections and/or Fillers to improvise existing wrinkles. Autologous fat injections may be performed in some individuals to enhance facial volumes to give longer lasting effects. The varied flaws in the facial contours and wrinkles can be addressed by means of Botox and Filler injections. The procedure is performed in the clinic and is comfortable for most patients. The wrinkles (crow’s feet, forehead lines, frown lines, etc.) can be made less visible with Botox while the areas with less volume or static wrinkles can be filled in using fillers. The filler injections last for one year approximately while Botox effects last for 3- months in most patients. Botulinum toxin injections are routinely used for cosmetic enhancement of the face and for treating Forehead lines, crow’s feet, frown lines, bunny lines, mild brow height asymmetry, fine facial wrinkles, and neck bands. The effect lasts for 3-4 months or even more when used for cosmetic purposes after which they may be repeated safely. The varied flaws in the facial contours and such as the tear trough deformity and any chin asymmetry can be filled in using fillers. The filling of a tear trough can decrease the appearance of ‘dark circles’ under the eyes in some patients. The filler injections last for one year approximately while Botox effects last for 3- months in most patients. Non-surgical temporary means of shaping your eyebrow using Botulinum toxin and giving it a beautiful lift can be done in a matter of minutes. The full effects can be seen in a week or two. Fillers can be used to further enhance the shape and aesthetic appeal if needed. Results last for varying duration following which it can be repeated. Ptosis in adults may be a result of uncorrected childhood ptosis, or due to acquired causes such as loosening of the muscle attachment on the eyelid, trauma or myasthenia gravis. Hence after detailed examination by an Oculoplastic surgeon, the treatment options may be discussed with the patient. For example, in case of acquired Apo neurotic ptosis, surgery is performed through a ‘hidden’ incision and the weakened attachment of the levator muscle is strengthened to raise the eyelid height. Facial skin tags, unsightly eyelid lumps or bumps may lead to low self-confidence and consequently affect one’s quality of life. These can be easily dealt with and removed with minimal or no pain using Radiofrequency technology that ensures almost ‘bloodless’ surgery. Middle age and metabolic disorders or hereditary causes can give rise to ‘lipid-like’ yellowish deposits in the upper or rarely lower eyelid skin that looks quite unsightly. This can be removed via a simple surgery under local anaesthesia after which the patient can immediately go home. Ophthalmic Plastic Surgery is a relatively newer branch that encompasses Oculoplastic (disorders of the eyelids and tissues around the eyes), Orbital surgery (full range of disorders affecting the orbit including tumours, fractures, thyroid eye disease, etc. ), Facial aesthetics (science to improve your facial appearance), Dacryology (tear duct problems) and Socket reconstruction (blind eye cosmetic rehabilitation, mucous membrane grafts, etc.) Ocular Oncology services are also offered under this speciality in in some centres including our centre. An Ophthalmic Plastic/Oculoplastic Surgeon is a surgeon who is an Ophthalmologist who has been specially trained in the plastic surgery of the face and periocular region and is an expert in the diagnosis and management of the range of subjects mentioned above. Ptosis - A condition in which the upper eyelid droops down due to various causes. One or both eyelids appear to be droopy. The infant or child keeps the chin elevated to see better. The child manually lifts up eyelid to see better. The eyelid position varies during the day, increasing when the child is tired. Abnormal eyelid position with squint. 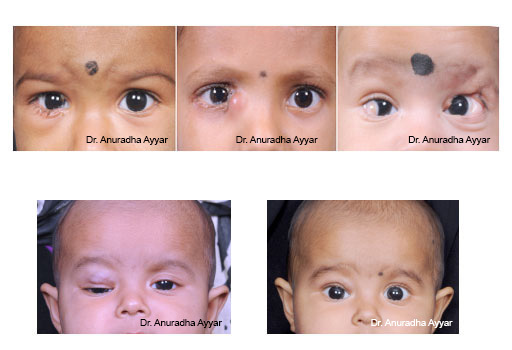 We provide diagnostic and therapeutic facilities for the watering eye in infants, children and adults. Probing and syringing for congenital nasolacrimal duct obstruction. Dacryocystorhinostomy (DCR): Surgery with ‘hidden’ and small incisions. Canalicular block assessment and repair. Treatment options for Punctal problems. Tear drainage problems may present in any age: from birth to advanced stage in life. Thyroid Eye Disease is a complex condition which requires regular and timely follow-up with an Oculoplasty consultant. The disease is treated depending on the phase- active or chronic. Active disease is characterized by redness in the eye, eyelid swelling, pain, and at times decrease in vision, the last being an emergency. In the chronic phase the protrusion of the eyeball and the eyelid asymmetry can be addressed through orbital bony decompression and eyelid surgery. Post trauma or post chemical injury eyelid malposition can be partly corrected or made cosmetically better by scar excision, eyelid reconstruction with skin grafts. Benign (non-cancerous) masses and malignant masses in the orbit can be removed by means of Surgical Orbitotomy with a barely visible/hidden scar in most cases. The mass is sent for Histopathological analysis. 2. Any unexplained redness and pain in the eye. Timely detection, treatment (local treatment/ chemotherapy/ surgery/ radiation/ any combination as decided by the Ocular Oncologist) can save lives. Ocular Surface Squamous Neoplasia presents in various stages to the Ocular Oncologist. 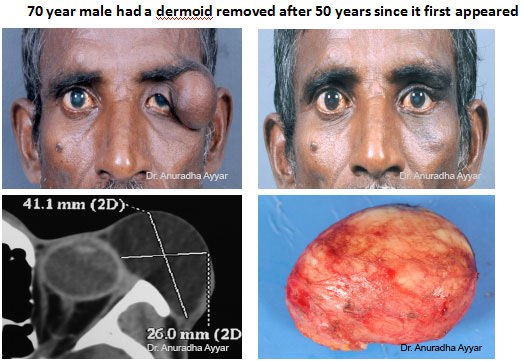 The tumour can be treated with topical/injectable medicines or surgically by removing the lesion. 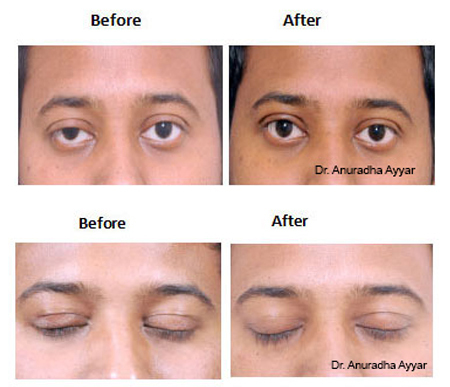 Eyelid cancer is treated by removing the affected part of eyelid and reconstruction in single or multiple stages.